Moroccan cuisine introduced me to some new, and rather mysterious vegetables that I hadn't encountered in the US but very much enjoyed eating in Moroccan dishes. Among them were cardoons. For several years I only knew them by their Moroccan Arabic names, khorchouf (or kharchouf) and kanaria, and it wasn't until I began writing about Moroccan food that I learned what to call them in French and English. So what exactly are cardoons? Native to the Mediterranean, the cardoon (Cynara cardunculus) is a tall, thistle-like plant which resembles giant stalks of celery. Like celery, the stalks grow in ridged bunches which are attached at the base. In Morocco and elsewhere in North Africa, cardoons can be found both as a wild plant (kanaria or cardon sauvage) and as a cultivated vegetable (khorchouf). 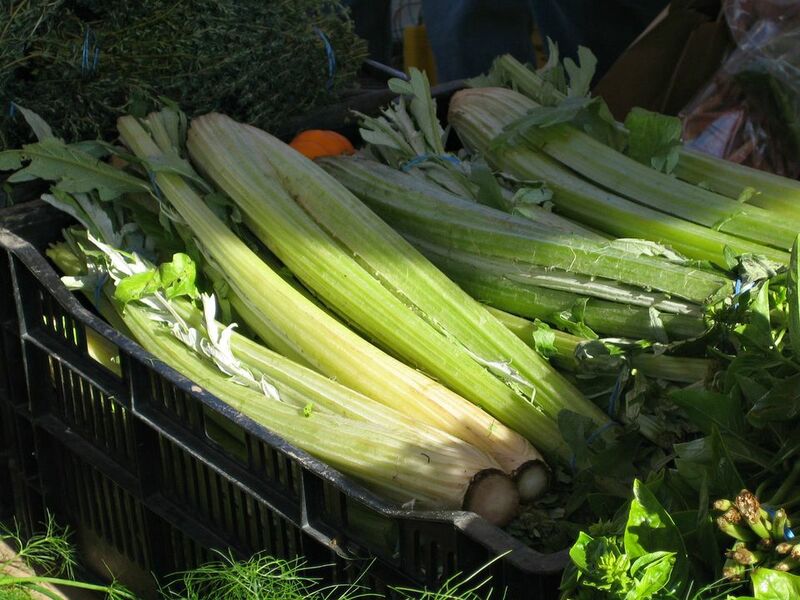 Despite cardoon's visual similarity to celery, the two vegetables are not at all alike in terms of flavor and therefore are not interchangeable in recipes. Cardoons taste quite similar to artichokes, which are a close relative. Cardoons can grow year-round, but they're typically sold in Moroccan souks as a vegetable during the fall, winter and early spring months. Beyond that time, they tend to become very bitter. During those cooler months, Moroccan cardoons are readily available and affordable (just several dirhams for a 1-kilogram bunch), but in the US and UK, where they're often viewed as an ornamental plant rather than a vegetable, they may be harder to come by, both in terms of availability and price. Although the flower buds are edible, it is the leaf stalks which are primarily used in Moroccan culinary preparations, typically in stew-like tagines such as Lamb or Beef with Cardoons or Chicken Tagine with Cardoons. They are also sometimes added to couscous. The stalks require a long cooking time to reach the desired buttery-tender state; therefore parboiling (see below) is often necessary before adding them to dishes for further cooking. When buying cardoons, select stalks which feel firm, not spongy or hollow. Pale stalks, which indicate the plant has been bundled and blanched, are more desirable than richer-hued ones, which tend to be bitter due to natural, higher chlorophyll activity. Thinner, younger stalks also tend to be sweeter and more tender than older, larger ones. Wild cardoons have far more thistles than the cultivated variety; nonetheless, even the latter should be handled with care while cleaning and prepping them. Removing the leaves and spiny edges of the stalks will make them safe to handle for the necessary paring of the string-like skin. This process is shown in the photo tutorial How to Clean Cardoons. Note that pared cardoon stalks will quickly oxidize; ensuring that the cleaned stalks come in immediate contact with acidulated water or lemon juice will prevent unsightly browning. Wearing kitchen gloves while handling the cardoons will also help avoid staining of your fingers. Once cleaned and coated with lemon juice, cardoons can be tightly covered and left in the fridge for several days or until needed for cooking. To parboil them, combine the juice of one lemon with two tablespoons of flour and a little salt and pepper. Whisk in about two liters of water and bring to a boil. Rinse the cardoons, add them to the boiling water, and simmer until tender, usually 30 minutes or longer. Drain and use as desired. Moroccan Kefta Stuffed Rolls - the Filling Is Baked in the Bread!